We all have them: recipes in the arsenal straight from Mom’s kitchen. We rarely mess with them because really, why mess with perfection? One of my favorite things about cooking from memory is that you have that select set of go-to, weeknight meals that speak to you heart the same way a hug from your mama does. 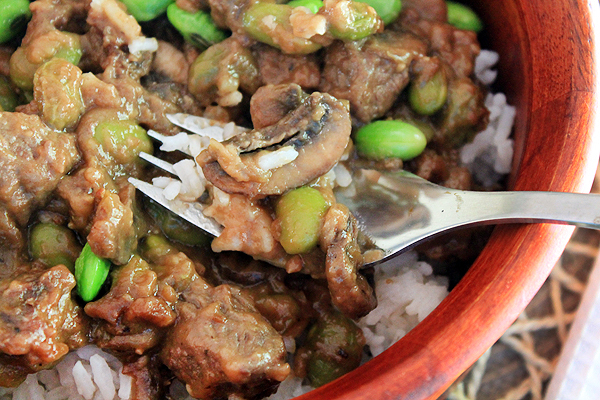 This Beef and Mushroom Stir Fry is one of those recipes for me. When I was a kid, my mom made this at least once every two weeks. 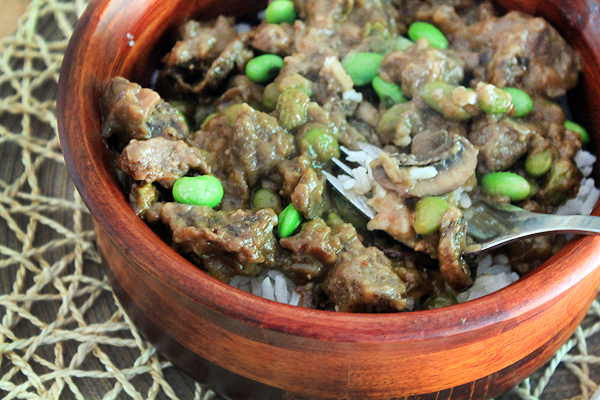 Pure simplicity: beef, mushrooms, soy sauce, and water, with a little flour to thicken. Sometimes there were bean sprouts, but more often than not, there weren’t. I don’t know why I haven’t made this simple supper more often in my adult life. It comes together quicker than take-out can be delivered, and I gotta be honest: to me, it tastes better. I joojed up Mom’s recipe only a little bit, I swear, and I am happy to report I don’t regret it. The addition of frozen edamame for a little green goodness, minced garlic for a further savory factor, and ground ginger to brighten the whole thing up. This may become my new Tuesday night go-to. How about you? Do you have a weeknight standard? In a large saute pan, heat olive oil on high heat. Pat stew/stir fry beef dry with a paper towel. When the oil slides across the pan easily, add the beef to the pan and season with salt and pepper. Stir often so that beef browns on all sides. Remove beef to a bowl when it is browned on all sides. Do not cook through, as the beef will become dry and chewy by the time the rest of the stir fry is cooked. Add mushrooms to the same pan the beef was cooked in and allow to brown a bit on all sides before seasoning with salt and pepper. Add edamame to the pan. Allow that to cook a bit, warming from frozen. Roughly 2-3 minutes. Add beef back to the pan. Lower the pan heat to medium. Sprinkle all purpose flour over the ingredients in the pan and stir. Add the soy sauce and water or beef broth. Stir well and often, allowing the sauce to simmer and thicken. When the sauce has thickened to your liking, add the minced garlic and allow everything in the pan to simmer a few more minutes on low heat. 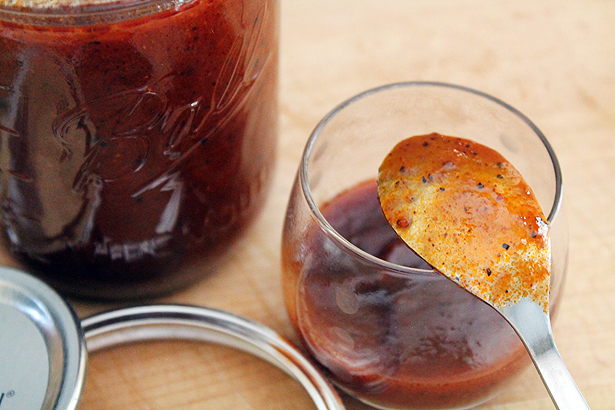 If you’d like to add some heat to your stir fry, stir in red pepper flakes for a kick. I remember being really excited about this recipe when you told me about it. I can’t wait to give it a go! I can see it becoming a favorite, Jamie. Especially because I know you’re going to Sriracha that bad boy up. This looks so delicious! I’m definitely going to give it a try. I grew up in a family where we ate the same meal every day of the week, week after week. I was so sick of it by the time I moved out that I had determined I would never do that. So, um, no weeknight standard. However, we do default to the same 2 or 3 meals every Friday during the school year. I love your additions to this. Ginger is one of my favorite things to cook with. I can see that being monotonous, Shaina. Ginger is one of James’s favorite flavors, so it was a no brainer to add it here. Simple, filling, unprocessed, gets the job done. And yes, just as easy as takeout! I wish more people realized this! Ohh, this looks like a recipe I need to tuck in my back pocket for those nights where the cooking fires just aren’t lit. Yum! Tara, for sure you do! Chicken could be subbed in pretty easy too, to shake things up. My husband loves stir fry, and in my opinion, the simpler the better! Trying out this one for sure! Shelly, let me know when you do. I hope you guys really like it! Though for your boys, you might want to double the recipe. They strike me as strapping guys with big appetites. Right? They save the day more often than not. I have a couple of recipes like this, like my macaroni cheese, which my mother taught me (and which her mother taught her and I love that I don’t even need to think about it when I make them, it’s almost second nature. This is such a perfect week night meal, anything that comes together this quickly is a winner in my book!